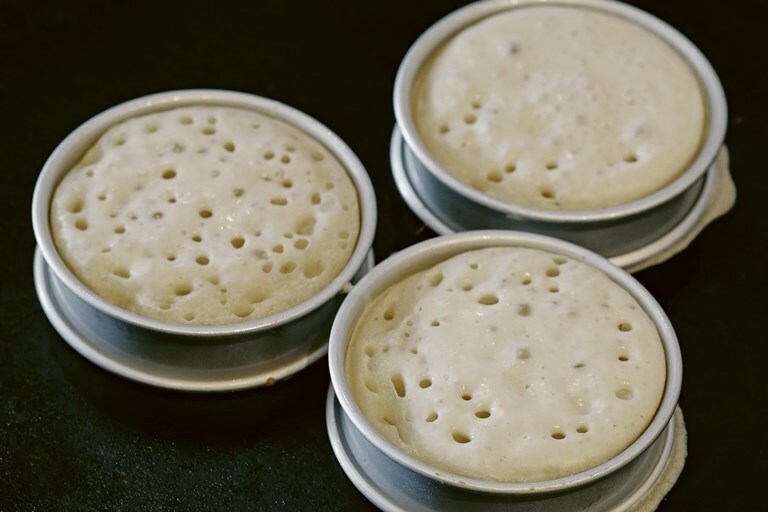 This crumpet recipe proves just how easy these beloved griddle cakes are to make at home. They're prepared in a similar way to pancakes, but the metal rings keep the batter in place to create tall, fluffy crumpets that are miles better than any you can buy in the shops. This recipe is taken from Crumb by Richard Bertinet, published by Kyle Books. Photography by Jean Cazals. I never saw crumpets in France but ever since coming to England I have loved them. There is something fantastically comforting about a toasted crumpet, spread with butter that melts into the little holes, either for breakfast or in the afternoon. You will need metal crumpet rings and a wide, heavy-based frying pan, big enough to cook four or five at a time. The knack is to get the pan hot first with a good coating of oil – not so hot that you fry the crumpets, but hot enough to cook them all the way through slowly without burning the undersides. I usually manage to burn the first one! So cook one by itself first for a test run. You can always have the oven on at 200°C and then pop them in for a few minutes to finish off.